Three basic dimensions are the same as RS Roller Chain, and the smaller plate waist gives the chain a 40% higher maximum allowable. Suitable for situations where RS Roller Chain would suffer fatigue failure, and also able to use one size smaller RS Roller Chain. Maximum allowable has been improved 5-10% over previous Super Chain with the December 2016 upgrade. 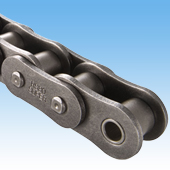 Compared to RS Roller Chain, kW ratings and shock absorption are greater, enabling the use of a chain 1 size smaller. Fatigue strengh is 32% higher than RS Roller Chain. Ideal for steel facilities, automotive manufactuing facilities, environmental devices, agricultural machinery etc. Super Roller Chains are designed for low to medium speed transmission. RS Roller Chain should be used for higher speed ranges that do not appearing in the kilowatt rating tables. Standard RS sprockets cannot be used for both single and multi-strand chains. 1P/2P offset links are not available for Super Roller Chain.